At Scuba Center we've been teaching scuba diving for since 1973. We were Minnesota's first PADI 5 Star Training Facility and have grown to become Minnesota's largest Scuba School. Scuba Center can offer you many PADI Specialty Instructor training opportunities which will expand your resume and open new educational possibilities. 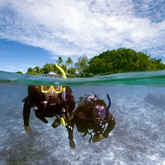 These courses also count toward the PADI Master Scuba Diver Trainer rating. PADI Five Star Instructor Development Centers meet all PADI Five Star Dive Center standards and provides the same level of service. They also meet additional training requirements and offer PADI Instructor-level training. If your goal is to become a PADI Scuba Instructor look to a PADI Five Star Instructor Development Center. The following is a list of the PADI Specialty Instructor programs available at Scuba Center. To get a better understanding of each Specialty, follow the links below to the corresponding "diver level" Specialty page. All courses include the student level manual (where applicable), the appropriate PADI Specialty Instructor outline, and Specialty Instructor application processing fee. Please contact us for more details including pricing and scheduling. These courses will help you work toward your PADI Master Scuba Diver Trainer rating. To train your students to the highest non-professional dive level in the PADI system, you'll want to become a PADI Master Scuba Diver Trainer. To attain this rating you must hold five PADI Specialty Instructor certifications and have certified at least 25 students. 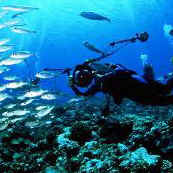 Upon completion of all requirements you may apply directly to PADI. Consult your PADI Instructor manual for the most current requirements.